To answer the question, "Which orange juice has the most vitamin C?" you need to understand a few things about orange juice production and distribution. Both can affect the quality and quantity of vitamin C in your morning juice. Consider also the differences between freshly squeezed orange juice and the various types available from the supermarket, such as frozen concentrates, juices marketed as not from a concentrate and so forth. What should be a simple question and answer turns into a dizzying array of choices, considerations, and facts. Florida's Natural Orange Juice: Sold in containers in the refrigerator aisle, this popular brand contains 120% of the RDA for vitamin C.
Tropicana Pulp Free Orange Juice: A direct competitor to Florida's Natural Orange Juice, Tropicana Pulp Free also contains 120% of the RDA of vitamin C.
Sunrise Valley Frozen Concentrate Orange Juice: Although this is a brand name, most concentrated orange juices are similar. This one contains 128% of the RDA for vitamin C.
How Much Vitamin C Is in an Orange? What Foods Are High in Plant Sterols? Looking over this list, it's clear that the same serving size of orange juice provides more vitamin C when you use a frozen concentrate instead of a ready-to-drink type. This appears to be standard information no matter which brands you compare; concentrates have more vitamin C per serving. However, the winner is actually freshly squeezed orange juice. According to the Nutrition Data tables, one cup of freshly squeezed orange juice has over 200% of the RDA for vitamin C. That answers the question on which orange juice contains the most vitamin C.
Looking over the comparison of amounts of vitamin C in various types of orange juice, you may wonder why there's such a discrepancy in the numbers. The amounts of natural vitamin C present in every orange vary according to the variety of tree, the amount of sunshine, water and minerals the tree receives, and even when the orange is picked. No two oranges have the exact same vitamin C quantity. 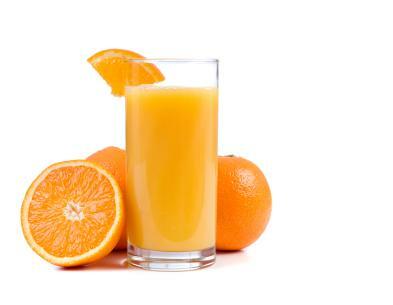 Processing and distribution methods also impact the vitamin C quantity in various orange juices. Heat and storage methods can degrade the amount of vitamin C in the juice. Pasteurization, for example, uses high heat to kill microbes, but a great deal of vitamin C can be lost through this process. Vitamin C is also lost over time, so the fresher the orange, the more vitamin C it tends to have. Different brands use different processes to create orange juice. Some tout their ability to take oranges right from the fields and create orange juice within hours or days of harvest. Companies making this claim are betting their brands have more vitamin C because the oranges are fresher. Other companies may purchase bulk quantities of oranges that have shipped from far away places or remained in storage, which decreases the amount of vitamin C in the product. Some even add supplemental forms of ascorbic acid, the chemical name for vitamin C, to up the total vitamin C quotient or add vitamin C to the product to tout its extra vitamins. Consumers seeking the best juice product can compare brands at the store and determine which one has the highest RDA on the label. But the ultimate choice is often dictated by consumer taste and lifestyle needs. If you're a busy mom who has to bustle kids off to school in the morning before heading off to work, you're more likely to choose a package orange juice that you can just pour and enjoy rather than struggle to juice a bag of oranges each day. No matter which brand you choose, drink up; you'll get plenty of vitamin C, and if you eat a variety of foods, you're sure to receive the minimal amount required for good health.